I have a generator that can operate at 240V/30A using a NEMA L14-30 outlet. Two questions: How can I test to see if the power it puts out is "clean" enough to charge the Model S in a power outage, and when will Tesla offer the universal adapters for the S that they currently offer for the Roadster? This brings up a good question. How forgiving are Tesla's to power inputs? In summer many time I have metered my panel and the incoming voltage was around 98/203 very dirty volts. My surrounding neighbors had the same range. We have called our electric provider but they really don't care. They just give us the neighborhood A/C use excuse. I noticed the problem because my ADSL modem was not on a UPS and it would not work on those days. I would assume at a minimum the car will just not charge if it's unhappy. This might be a question to actually make a call about. I would think that any generator that can handle the continuous output should be fine. Not all 240 volt 30 amp generators can work on a continuous load. Don't worry about it. A true generator, as opposed to an inverter, creates a nearly pristine sine wave output. The majority of causes of the crappy power you're getting from the grid is related to the surges, dips, and noise incorporated into the grid power by the electrical devices your neighbors, i.e. everyone sharing your feed from the power production facilities. As long as your car is the only thing connected to the generator, your power will be plenty clean to charge with. On a 30A connector, the charger can only draw a continuous load of 24A. You need to be certain your generator is rated for that continuous load. If not, you'll have to program the car to limit charging to stay under your generator's limit. Sadly, the presence of a 30A connector and breaker is no guarantee it can sustain those loads for an extended period. @ Babyrocket - The Model S Options and Pricing page indicates that the Mobile Connector comes standard with all Model S configurations and includes a 110 volt standard household outlet adapter, a 240 volt outlet adapter, and a J1772 public charging station adapter. It also notes that other outlet adapters are available for purchase. The Model S Charging page indicates that your Delivery Experience Specialist will offer you a choice of 240 volt outlet adaptors when you take delivery. This same page lists charging specs for 4 NEMA 240 V adaptors. The NEMA 14-30 is one of the listed adaptors. I have ordered the Twin Charger option and would like the ability to use it. Please do not respond with "their are few public installs of the 80 A". This will come quickly since 30 A is to slow to charge a car at a pit stop. And yes I still hope they support DC charge on the 40 kwh battery. @murraypetera I didn't even know there was an 80A spec available for J1772. Glad you mentioned it. I sure hope the adapter works with that rating. That would really help a lot. Note there is a pretty large step in wiring rules for an 80A installation vs a 30A installation (2 gage vs 10 gage for must runs). It's sad how short sighted all the charging station installations are right now. I wish people who design things would be more forward looking. The Leaf has conditioned people to think that 6kW is sufficient unless you go DC. Meanwhile the fact that existing cars can't charge at more than about 18 miles per hour doesn't change the concept that 18 miles per hour is completely useless unless you are sleeping or have something to do for a many hours while you wait. What if you want both 240v adapters? I've got the 14-50 at home, but may encounter 14-30 in the wild. I could probably get an RV "dogbone" to adapt the 14-50 plug to a 14-30 socket for about $20, but if the second adapter is available to purchase, I'd like to consider it. 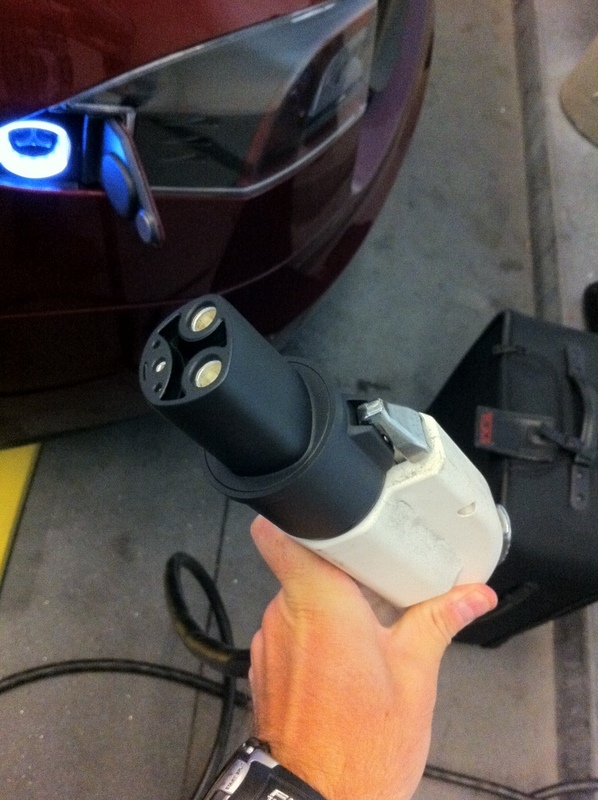 Yes, Tesla's J1772 adapter for Model S is 80 amp capable. But, why would the makers of commercial J1772 Level 2 charging stations incur the extra wiring and equipment expense to provide that much juice on the off chance that a Model S or some other EV that can take more than a 30amp charge might show up some day? It's a matter of economics. Besides, most commercial Level 2 chargers charge by the hour, not by how much power is delivered. It's to their advantage to keep it at 30amps. They make out when I'm charging my Leaf. I will make out when I'm charging the Model S.
It would make sense only if they wanted to "future-proof" their installations. With the exception of Tesla vehicles, most cars cannot use that much current. But if EVs ever take off as real ICE substitutes, they will have to. On the charging front... I removed "twin chargers" from my configuration. I don't plan on buying Teslas "high power wall connector" but will charge @ home on a 14-50 plug. and here's why.. The mobile connector that comes with the car is only 10KW rated which I assume would have to include the J1772 adaptor as well since it is designed to work with the mobile connector, So unless the mobile connector was rated for 20kw "assuming one could find public chargers existing in the wild that are capable of that charging rate"?? Therefore without the High Power wall connector at home the twin charger option seems moot. While @ home charging @ 62 mph vs 31 mph is not a huge deal as the car will gain a full charge overnight even on a 14-50 anyway ( I gotta sleep lol). I opted instead to scratch the $1500.00 twin chargers and add the optional $2000.00 "super charger hardware" which provides much more value for the $$$ because it enables me to charge cost free @ super chargers for the life of the car "as it is offered currently". Am I wrong here? Thoughts.. PLEASE! Superliner, I agree that having the High Power wall connector at home does not make much sense (what are the odds that you just drove hundreds of miles, return home, and have to charge quickly for another long trip???). I have the 14-50 outlet set up. On the other hand I also have the Twin Chargers (85kWh battery) because 1.) while current public chargers are mostly 30A max now, who knows about the future and 2.) prior to the availability of the Super Charger network, I may need to make use of Tesla service centers' High Power wall connectors on long road trips in order to get a faster charge (assuming they would be so kind). I guess it is a matter of opnion depending upon one's driving needs. Public chargers have their own charging cables, you don't use the mobile connector with them. At least that's my understanding. @Superliner - Your logic about twin chargers and the HPWC is correct, IMHO. However, the J1772 adapter is not used with the 10KW Mobile Connector. It attaches directly to the J1772 plug from the charging station: http://teslamodelsxc.files.wordpress.com/2012/09/img_0025.jpg There are some public access high power Tesla Roadster chargers that have been converted to high power J1772 (http://www.recargo.com/sites/632), but AFAIK, they are few in number.